The tallest & the highest grows more. 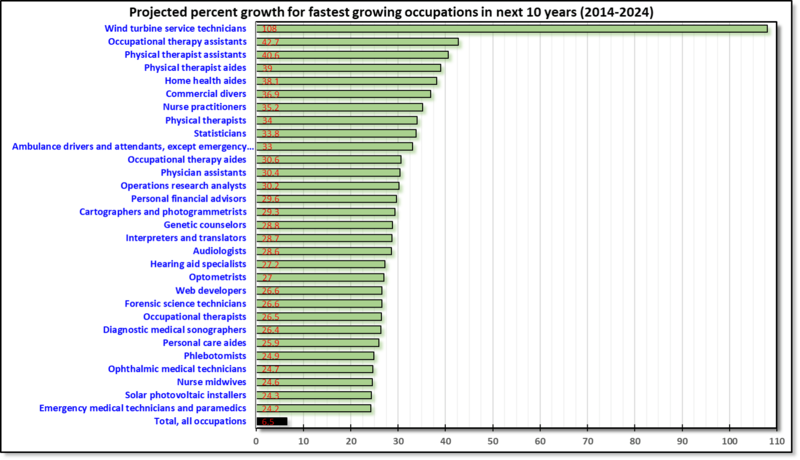 Wind turbine technicians expect highest growth among the fastest growing occupations, projected for 2014-2024. (Click the image to enlarge) This chart shows the projected growth (in percentage) for the fastest growing jobs in America. The number of jobs for wind turbine technicians are expected to more than double due to the strong focus on renewable energy. However, this number might have some competition from the solar industry which has seen a dramatic fall in price in past few years. These are mainly male focused jobs, often in remote areas including offshore farms, and thus resulting in a current shortage of people in this field. This is likely the main reason for such a higher percentage growth. Additionally, the wind energy technology has not seen any new technical break-throughs, similar to solar & autonomous vehicles, that might compete for this occupation. When seen in conjunction with yesterday’s plot (Chart of the day – Aug 30, 2017), it shows salary has no correlation to the expected growth. Although the highest growth is for healthcare assistants & aides, their salaries are expected to stay low due to minimal specialization & lower barrier to entry. The jobs with lower growth are the ones that already have a large number of professionals working in them. As the population ages, more jobs for aides & assistants will be required but automation may compete with the already higher number of workers in these professions. As health care provides tighten their margins after Affordable Health Care became law, a strong focus on preventative care will also reduce the needs for aides. Other low growth occupations have their own unique reasons: not many solar panel installers needed as the life span of panels increases and their installation saturates over time. Source: US Bureau of Labor Statistics, same source as yesterday’s data.